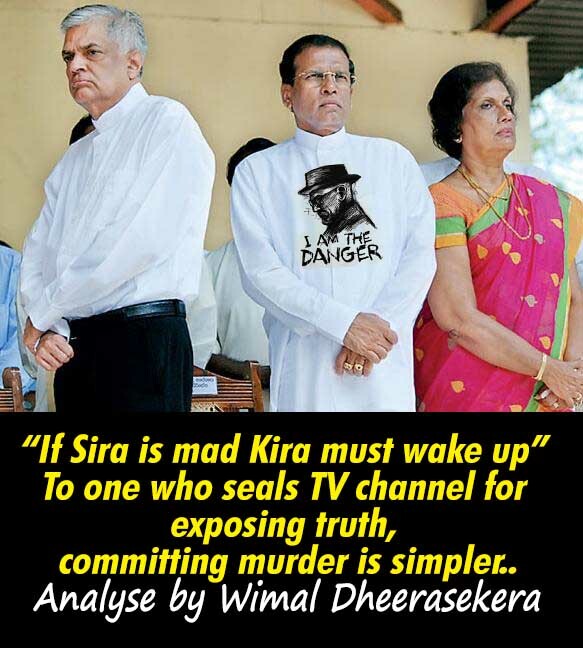 LEN - www.lankaenews.com | “If Sira is mad Kira must wake up” To one who seals TV channel for exposing truth, committing murder is simpler..
“If Sira is mad Kira must wake up” To one who seals TV channel for exposing truth, committing murder is simpler.. The writer told him , by your telling us this personally instead of highlighting to the public, the people’s opposition being mounted against the UNP for the venomous and vicious actions of the president cannot be averted. But if that situation is to be reversed , the UNP while performing the duties as a government must also engage in the tasks of the opposition , the writer pointed out to him , to which the UNPer had nothing to say. A month after this discussion , on the 5 th the TNL channel belonging to the elder brother of Prime Minister (P.M.) was sealed on the instructions of the president . Consequently , a number of UNP leaders had to condemn the action of Gamarala and openly say this government is useless ,and they would have to associate with the opinion of joint opposition . We of course anticipated this because the cruel hand that hit below the belt of Lanka e News, we knew is surely one day going to wring the necks of others too. Therefore when the TNL was sealed subsequently it was not a matter for surprise. We expected this media strangulation , only we did not who will be the next victim and when ? Even the Rajapakses who are a byword for media suppression and earned an ignominious distinction in that direction in the whole of Asia did not ban the TNL . There were a number of reasons for that..
Shan was the elder brother of Ranil Wickremesinghe and was of a noble character who never got himself embroiled in the politics of his younger brother. Nor did he use his younger brother for his business promotion. He was conversant in every aspect of engineering technology , and possessed of an unbelievably impeccable character. He is a wizard in electronic waves transmission science . If a water pump of the TNL (of which he is the chairman) goes out of commission , he will not hesitate to get down to the bottom of the well to attend to the repair. If a telephone does not work , he will himself take a screwdriver and mend it. Amidst all his onerous duties if someone seeks his help , he would put aside all his work and spend his precious time to teach them from to A-Z without demur. Truly speaking he is not only Ranil’s other side but also the good side. In SL such a Shan Wickremesinghe is one and only. Sri Lanka’s first television channel ITN was launched by Shan with his friends Anil and Bob in April 1979 , and was broadcasted within a fifteen (15) mile radius of the city of Colombo. On June 5 th same year , JR’s government took over the channel of these youngsters without paying any compensation. It is a coincidence of fate exactly 39 years later on June 5 th , Gamarala who has become a country’s scourge sealed Shan’s second Television channel . In 1979 when the government acquired Shan’s television channel which he looked after carefully like his child , Shan did not lose heart. Late Premadasa who came to power subsequently , after realizing the injustice that was done to Shan decided to pay compensation for the loss , and issued him a television channel electronic transmission license. Though the license was obtained , Shan could launch his TV channel again only in 1993 -14 years after the ITN was acquired by the government . After forming the Company Telshan , TNL was commenced as the first private television channel in SL. It is such a valuable pioneer TV channel , Gamarala sealed after obtaining a court order without both sides being heard alleging that license fees have not been paid for the last 25 years . The television channel of Shan who inherited mass media skills beginning with his grandfather D.R.Wijewardena down through his father Esmond Wickremesinghe , which coupled with Shan’s engineering knowledge was not only the first TV channel but also adorned the mass media history . It was Shan’s TNL that was the first private channel which telecast news. It was TNL that started the first fascinating and popular TV drama series “Kopi Kade’. This drama series is still on going. It is TNL again which commenced the first political debate program ‘Janahanda’, though other channels too have started some meaningless debates later. That program too is still continuing. The hilarious ‘Always breakdown’ political program too was introduced to the television media for the first time by Shan’s TNL, but by now that program has been terminated. The ailment afflicting all channels , that is the Temple visiting Poya day live program was for the first time introduced by TNL which is still continuing. The mad maniacal pavement dog which sealed the TNL might not be aware that the TNL channel of Shan has entered the Guinness book of world records. That was , following the medical program that was conducted with Dr. Jayalath Jayawardena for many years without interruption. That program created a world record as the longest TV program conducted without interruption. It is such a world famous world record breaking TV channel which was sealed by moron Pallewatte Gamarala who prefers his own tomfoolery and buffoonery to well meant constructive criticisms against him .The irony of it is , it is this very leader after appointing a mass media pundit as his party general secretary who chose this course of action against the TNL .Not only those who learnt communication from Prof R.L Piyadasa the pundit , but even all others must be waiting in earnest to learn what he has to say in this regard. It is only a rabid maniacal dog from the pavement which would indulge in such destructive and despicable activities…. This Gamarala’s action will certainly go down in media history as the most despicable and detestable any leader of a country could have resorted to .No human would resort to such an action , let alone think of it , unless he/she is a born pariah . In order to justify the action it is being said , the license is valid for broadcasting and not for telecasting .If anybody is to say that TNL has been engaging in telecasting activities for 25 years without a license, that individual’s mental condition should be examined. It is being said the levies had not been duly paid. On the other hand, according to Shan all fees have been duly paid. In case , if he has ignored payment , what must be done is , send a letter inviting attention to payment. If such a letter has been duly sent we challenge the TRC to prove it. If the reminders are unheeded , a deadline has to be issued for payment before the license is cancelled , and sealing shall be the final resort. Instead ,if a court order is taken on the sly unilaterally without noticing the owner of the channel , and the Institution is sealed , is there a better description than ‘pariah mad dogs’ to those indulging in such rascally methods? Such media bans we have witnessed only during the time of Hitler and during criminal activities of the ISIS brutes. The troika must resign forthwith …. It is the TRC chairman Austin Fernando who says his belly is white should be answerable primarily to this debacle. If Austin’s belly is truly white how is that he is working under a pavement mad dog still ? In addition the masses have an issue with two individuals who talked most loud about media freedom in the recent past . One of them is , Dharmasiri Bandaranaike who is now Director General , Cultural affairs. If the culture of the pavement mad dog is, sealing a mass media Institution on the sly , the people must be questioning Dharmasiri the loud mouthed champion of media freedom cause , is he still the director general to safeguard such an atrocious culture? The other individual is Sunil Jayasekera who shouted and screamed in the streets to promote media freedom like a fish monger to sell his fish . Jayasekera is now the media director under the pariah dog. Sunil who resigned the post for some inscrutable reason , later got himself reinstated, ought to be asked how his media director position under the mad dog become pleasurable now? We are questioning this troika because the people are still believing this troika is having a conscience and guided by it. Others of course being puppies of the pariah dog , those don’t concern the masses. Foretelling of the future by the writer after sealing Shan’s TNL…. The UNF government under P.M. Ranil Wickremesinghe which is a bugbear for the president is spilling over with problems , but that is going to end to some extent. The people have come to know of the vindictive aims and objectives of president Gamarala who steered forward an abortive no faith motion against Ranil , and even took revenge on Ranil’s brother . Those dastardly moves of Gmarala are going to be advantageous to Ranil’s government. The people would now understand president Gamarala and Ranil’s government are not same and they are different. The government of course should be able to exploit the situation to the full. If mouths are kept shut and the blows are to be endured as Ranil says, it must be decided ,how can such a ‘ ponna (effeminate) government’ which cannot stop the one who is attacking save the nation ? and take measures to slate the ponna government and give one fatal blow to both the mad dog which is attacking as well as the ponna government , and get rid of both. . It can be presumed , after Pallewatte Gamarala excreted on the head of Ven. Sobitha Thera at his death commemoration, and following Gamarala’s deadly and portentous media suppression , the UNP leaders must have been pushed to the edge so much so they cannot just idly watch and wait any longer. This sealing of the media Institution portends grave danger to the future political landscape …. Pallewatte Gamarala first instilled fear into the internet media by imposing a ban on Lanka e News the leading Sinhala news website which was a pest to him , as it was exposing all his treacheries and trickeries fearlessly , frankly and forthrightly. By that he punctured the heart of internet media. In like manner he instilled fear into the television media channels that are a source of annoyance to him by sealing TNL the leading television channel in SL , which is owned by P.M.’s brother . By that he punctured the heart of television media . What remains to destroy for him next is the personal character of those who are criticizing him. He is not going to stop. He will be going to the extreme point to attack them so much so they will not be able to rise again. Pallewatte Gamarala so far only has not committed murder . Now he has arrived at that point too. Gota being his closest friend ,theoretician and mentor now , it is doubtless Gamarala will not hesitate to do killings too in the not too distant future. It is a well and widely known fact Gamarala whose popularity base has dropped steeply to a mere 4 % , and is on the fast track to doom is now like a rabid dog biting and attacking all and sundry . Obsessed with greed for despotic power ,like others dictators in history is devouring everyone and every Institution that criticizes his perfidies , traitorous and anti democratic activities.